Our experienced advisors take the time to match a tutor to your child's personality and difficulties. School Success offers a personalized support system, whether it be for a specific difficulty, catching-up when they've fallen behind, homework help, or preparing for exams. 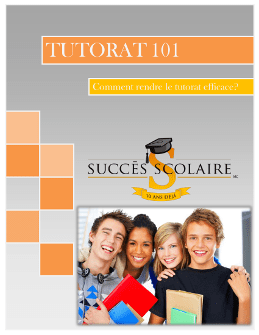 Tutors in Montreal offer services online, at home, or at the learning center in Côte-des-Neiges. Before becoming part of the School Success team, all our candidates must undergo a rigorous certification process during which their competencies are tested and their criminal record is verified. All tutors have experience with children as well as a university degree (undergraduate or graduate) related to the subjects they teach. School Success has help over 30 000 students since 2006. 92% improved their grades and 93% noticed an improvement in their motivation for school.